Grip strength is an important factor in weightlifting that significantly affects your performance. By maintaining a steady grip, you can focus on your technique and progress faster. You can improve your grip strength by practising certain exercises, such as heavy shrugs and farmer’s walks. However, no amount of grip strength or experience will stop your hands from sweating. And it’s the buildup of moisture on your palms and fingers that kills your grip faster than anything else. This is where chalk comes in. Gym chalk is traditionally made of magnesium carbonate, which is highly effective at absorbing moisture. It’s sold in both dry and liquid forms. Both have their pros and cons, so we’ve ranked the best examples of each that are currently on the market. Do You Need Chalk for Weightlifting? Before we get into the list, let’s take a look at how chalk is used for weightlifting and why it’s effective. If you go by the movies, you’re supposed to clap enough chalk onto your hands to create an asphyxiating cloud of white powder all over your home or public gym. However, in real life, less is more. Applying too much chalk may simply leave a muddy layer on your hands that does little for your grip. You’ll also end up having to buy pounds of it every week to keep up – not to mention the mess. Instead, apply a light amount of powder or liquid chalk onto your palms and fingers where your hands grip the bar. To prevent the chalk from mixing with your sweat and caking up, dry your hands with a towel before you apply it. If you’re in a public gym, be sure to keep things clean. Because gym chalk dries out your hands, your skin may become a little dehydrated after a few sessions. 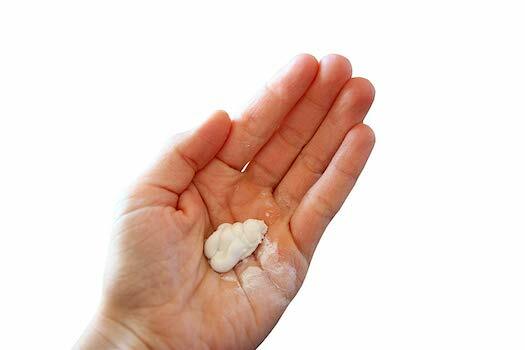 To prevent your skin from cracking up, consider using some hand moisturizer after training. While powder chalk is highly affordable and easy to use, it can become pretty messy. Whether you’re training at home or out at the gym, it’s important to clean up after yourself. To make things easier, keep a damp towel or cloth with you when you train. This makes it easy to wipe up all the powder after applying your chalk. Alternatively, you can opt for liquid chalk, which doesn’t really make any mess. You should be able to wash liquid chalk off your hands with water, however if you’re having trouble getting it off your equipment, a little bit of rubbing alcohol will do the trick. Now that you know the ins and outs of gym chalk, it’s time to choose one that will work for you. Listed below are the top three dry chalks, along with the three best liquid chalks that you can buy right now. Dry chalk is the original, and many would argue the best, kind of chalk. It typically comes in either pressed blocks, or bags of loose powder and it has its pros and cons when compared to liquid chalk. One the primary advantages of dry chalk is that it’s relatively cheap, meaning your money goes a long way. A single block of chalk should last at least a month of regular use, and most dry block chalk comes in packs of 4 or more. Bags of loose chalk offer less value, but are usually still affordable (in the $10 – $20 range) and should last a good while. Another pro of dry chalk is that it tends to be more effective than liquid chalk at bolstering your grip. This is likely to be a point of contention, with many people arguing the other way around. The general consensus amongst lifters, however, is that dry chalk is the more grippy form. Dry chalk is also messy. This is probably its biggest drawback. Of course, to an extent this will come down to the individual using the chalk, but even when you’re using it sparingly and being careful, dry chalk does tend to end up all over the place; the floor, the barbell and plates or bumpers, and your clothes. With that said, here are our top dry chalk recommendations. 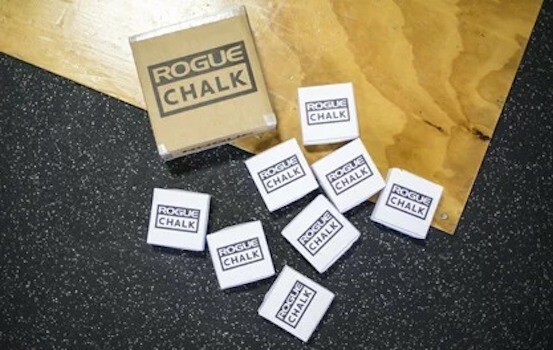 There’s no better way to define Rogue’s gym chalk than in their own words: “A basic essential at a higher quality.” A single pack runs for less than $12 and includes 8 blocks totalling 1 lb in weight. Even with daily use, it’s enough to last you through a season, if not a little longer. This Rogue chalk effectively absorbs moisture without dissolving or caking up. It feels very smooth going, and will make it seem like your hands are glued to the bar. This will help you hit PRs more frequently and consistently. The convenient 2 oz blocks are easy to apply and won’t break up. If you’re keen on maximizing value, you can grab a pack of 5 at a nice little discount, Fast and affordable shipping adds even more value to this gym chalk. 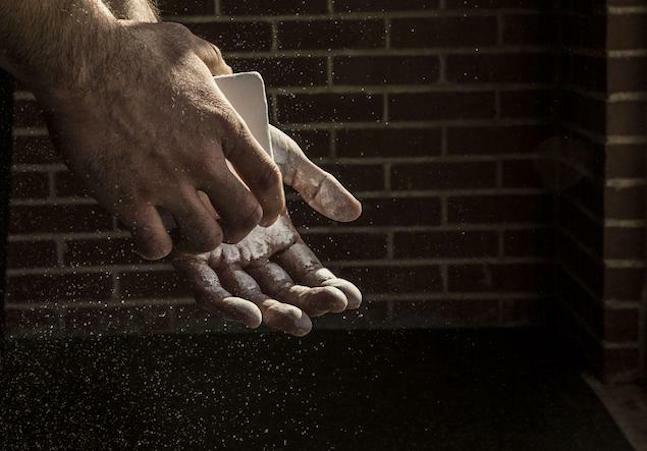 If you’re new to chalking up before lifts, into rock climbing or gymnastics rings, then give Rogue’s gym chalk a go, and we guarantee you’ll wonder how you ever thought your grip was any good to begin with. If you plan on doing more intense training or want something that will keep your hands dry no matter what, then Spider Chalk’s bags of premium gym chalk offering is for you. The laboratory-grade magnesium carbonate is made in the US and guarantees a smooth, lasting stick. 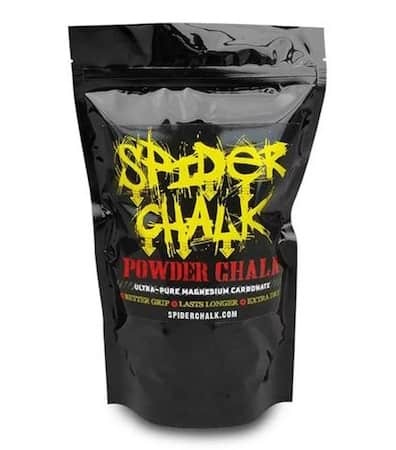 Spider Chalk is available in 8 oz and 12 oz bags that are sealable and easy to pour with. Orders placed on Rogue’s website before 3PM will be sent out on the same day with immediate tracking. The grippy texture and long lasting hold make this a considerable premium option without a steep asking price. If you prefer your dry chalk in blocks, Spider Chalk offer 1lb packs of ‘mega blocks’. 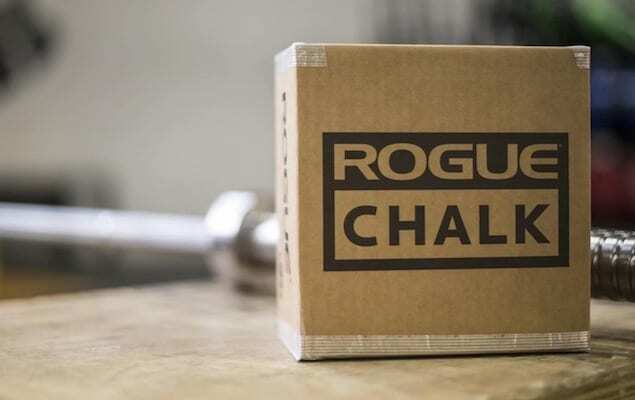 Like Rogue, Rep Fitness offers their gym chalk in 1 lb boxes packed with 8 blocks weighing 2 oz each. 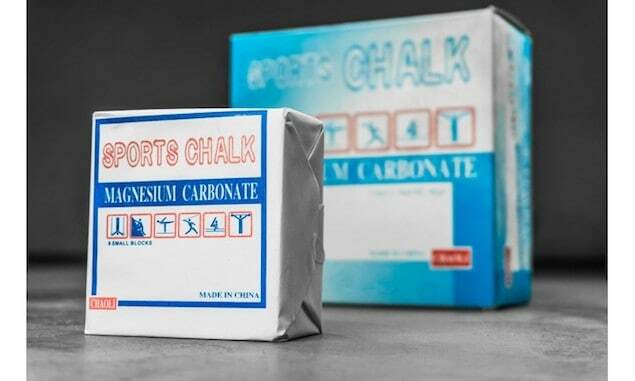 While slightly more affordable, this chalk is still made up of pure magnesium carbonate. The sticky texture provides a comfortable hold and does a great job absorbing moisture without caking up. Same day shipping, bulk discounts and a one month money back guarantee add a ton of value to this gym chalk. Each order is shipped in a safely packaged box with the blocks placed together within additional wrapping. As with any gym chalk, it’s suitable for not only weightlifting, but also rock climbing, gymnastics and any other grip-demanding sport. 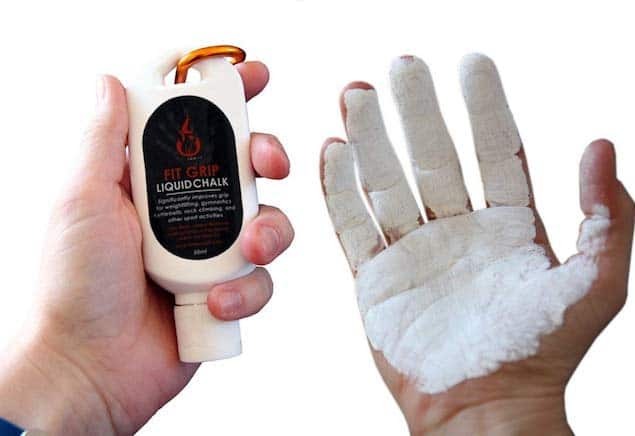 Like dry chalk, liquid chalk has its advantages and disadvantages. Liquid chalk tends to last longer during sessions than dry chalk. Whereas dry chalk requires constant reapplication to ensure that wonderful sticky grip on every lift, liquid chalk generally needs a single application, and more often than not you’ll be good for your whole routine. For whatever reason, liquid chalk also seems not to get everywhere like dry chalk does. You’ll end up with some on the bar, but other than that it usually stays on your hands, which means that it’s suitable for taking to public gyms where dry chalk often is not permitted. The main drawback of liquid chalk is that it’s expensive relative to dry chalk. You get a hell of a lot less product for the same or higher price than dry chalk. This is offset by the fact that it lasts on your hands much longer than dry chalk, but the cost can add up nevertheless. Interestingly, liquid chalk is essentially just dry chalk suspended in isopropyl (rubbing alcohol), which means that you can make your own and save yourself a few bucks. Here’s a video showing you how. If you don’t want to go to that effort, then check out the best liquid chalks below. Liquid chalk, while pricier than powder, guarantees enough grip from one application to last an entire high-intensity lifting session. You also don’t need to worry about messing anything on your clothing or equipment. Liquid Grip is made from entirely natural products in the US and is biodegradable. 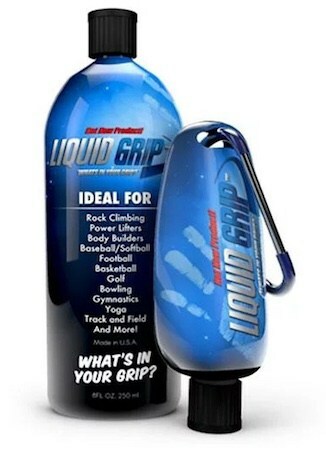 Liquid Grip is available in both 1.5 oz and 8 oz bottles, along with a money-saving combo pack that includes one of each. The 1.5 oz bottle is fitted with a handy keychain loop that allows you to attach it anywhere and keep it with you on the go. Pick up three or more and you’ll get a discount on shipping. This liquid chalk is rated to last ten times longer than powder chalk while also offering superior grip. Within seconds of application, the liquid dries on your hands – and stays on them. There’s no worrying about it sticking to everything else as it’s engineered to bind with your skin. The 1.69 oz travel size bottle also features a loop that you can attach to a clip for convenient access whenever you need it. The consistency of this liquid chalk gives it a similar feeling to lotion. It has a light fragrance that combats the odor you usually find on sweaty metal bars. Removing the chalk is as simple as washing your hands with soap under warm water. Once washed off, there’s no leftover residue or stickiness. Buying the Sportmediq Pro Grade Chalk through Amazon makes Prime users eligible for free shipping for even more value. 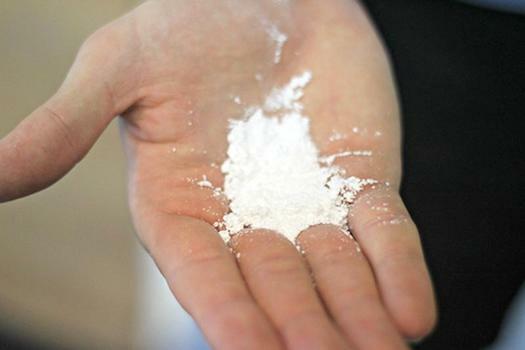 Concluding our list of the best weightlifting chalk is Liquid Fit Grip’s powder alternative. Like those mentioned above, this liquid chalk is easier to apply and doesn’t make a mess. One application will last an entire session, allowing you to focus on your sets instead of constantly slapping more chalk on. Liquid Fit Grip offers their chalk in two different types of bottles. The smallest option is 50 ml in volume and features a carabiner that you can attach to a clip. This allows you to clip it onto your clothing, belt, backpack or virtually anything else. There’s also a 250 ml bottle, along with an optional 50 ml refill if you want to make your purchase last. Simply rub it onto your hands and in about ten seconds the chalk will be dry and ready to go. This chalk tends to have a slightly thinner consistency than the others. If you prefer a thicker layer, you may need to apply a little more than usual. To effectively perform intense lifts that require speed or strength, you need friction. Your hands have a lot more friction when dry – and nothing keeps them dry better than chalk. Dry hands can lift heavier weights for more reps, which means you can continue improving and become stronger. Another advantage of having a solid grip is how it impacts your form. When your hands are slippery, you constantly have to re-adjust your hold on the bar. This alters your form and can lead to poor progress or even injury. With chalk, there’s no need to readjust as you’re able to maintain a consistent grip. Lastly, gym chalk helps protect your hands from tears and blisters thanks to the additional layer over your skin. What’s great about this is that unlike weightlifting gloves, your hands are still exposed to the bar and will therefore continue becoming stronger over time. 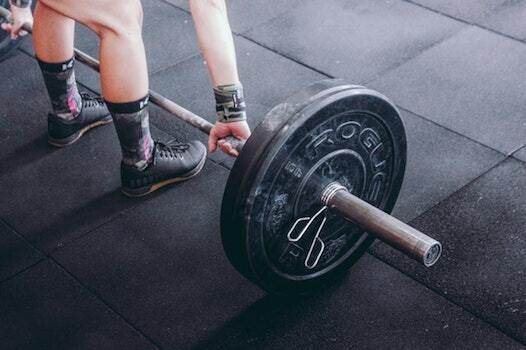 Well, there you have it: The best chalk for weightlifting. Whether you’re after a great dry or liquid chalk, the recommendations above should serve you well. 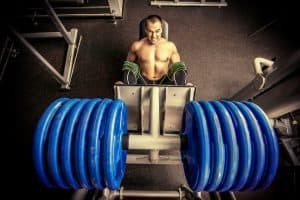 The intense and often brutal nature of weightlifting may give the less informed the impression that small details aren’t considered important. Yet, often overlooked factors such as grip can make the world of a difference. 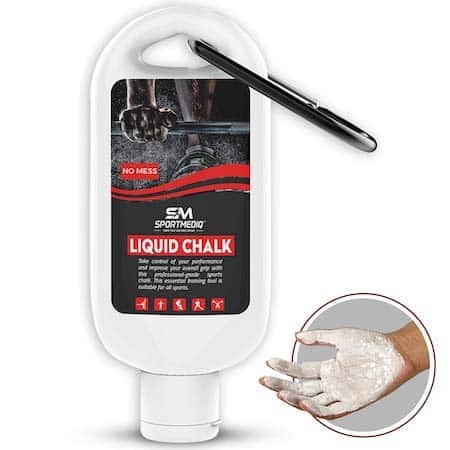 What makes this great is that all you need to significantly amp up your grip is a simple and affordable product like chalk. Depending on which chalk you choose to buy, there are virtually no negative effects apart from potential drying of your skin, which, as we learned can be alleviated with a simple moisturizer. Take care of your hands properly, and over time your skin will harden and become stronger while being less prone to drying, cuts and blisters. Not having to constantly make adjustments due to failing grip allows you to focus solely on your body and lifting with good technique. 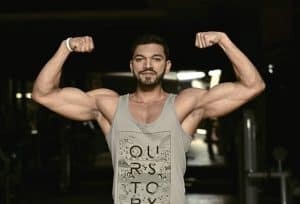 In the same light, practising correct technique makes you much less prone to lifting-related injuries. 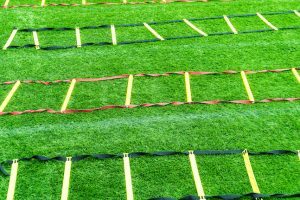 It’s hard to believe that such a simple, affordable and easy to use product could allow you to make significant progress and become a better athlete. Yet, it’s clear that gym chalk does exactly that.